The UK-TPWG has been reporting on the recent fires which have raged across Indonesia. Dr Tom Smith has recently commented that, in less than twenty days, the CO2 emitted from the fires exceeded that emitted by the UK for an entire year. This week, Sara Thornton, a doctoral student at the University of Leicester who has just returned from fieldwork in Palangkaraya, has kindly provided us with another informative first-hand report of the fires and their effect on human and animal health. Sara has been living in Indonesia for the past 15 months, researching the importance of fish and fishing to local communities, and the piece that follows is a personal account of her experiences. The fires in Indonesia are a global carbon emission catastrophe, but wildlife also suffers in many ways, the obvious one being habitat destruction. There is little information regarding the health impacts of the haze on wild animals, but 16 orangutan babies have been diagnosed with acute respiratory infections at the BOS Nyaru Menteng Orangutan Rescue Center in Central Kalimantan. As primates, the impact of smoke on orangutan health is just as serious as it is for humans. For non-captive animals, Cassie Freund, Program Director for Gunung Palung Orangutan Conservation Program explains: “Some animals die in the fires, whereas some are forced out into human-dominated landscapes where they are more susceptible to poaching and hunting.” (See her account of the fires and haze here). When you have worked in a peat swamp forest for a while, the impact of the haze is easy to see; you can watch the forest changing around you with increased leaf senescence. As a moist tropical rainforest, when fires do happen the trees are un-adapted to this and high tree mortality occurs with the tree composition in an area significantly altered even in the short-term. So animals become less active, the gibbons stop singing and as the weeks pass the forest becomes quieter, darker, and drier. 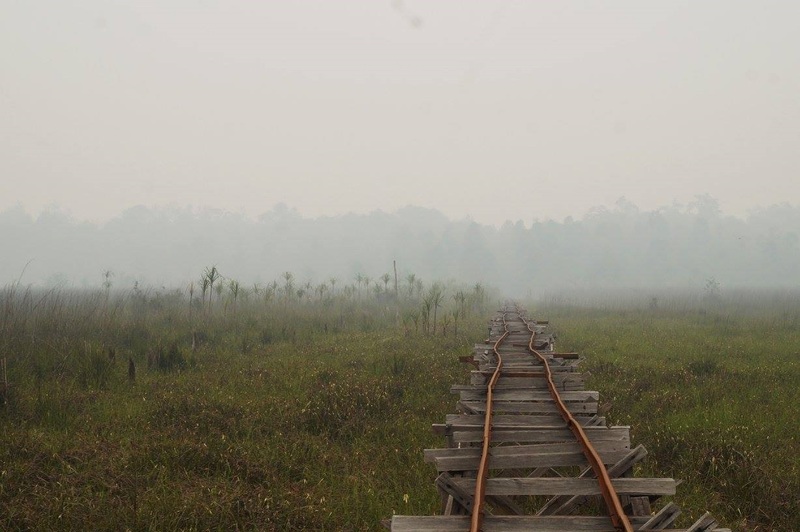 The rail used to transport researchers to and from the Setia Alam base camp in the Sabangau Forest. Usually you have a wonderful view of the forest as you travel towards it, but on this day with severe smoke haze, you could hardly see it. The concentration of dust particles in the air can be measured on a Pollutant Standard Index (PSI) ranging from 0-300+. Anything above 300 is considered hazardous (healthy levels range from 0-50). While I was there, Palangkaraya experienced the highest concentration yet of dust particles, reaching a horrific PSI level of 2,300 in late September. Severe respiratory problems and resulting deaths are on the increase, with children, the elderly and those already facing health issues more at risk. 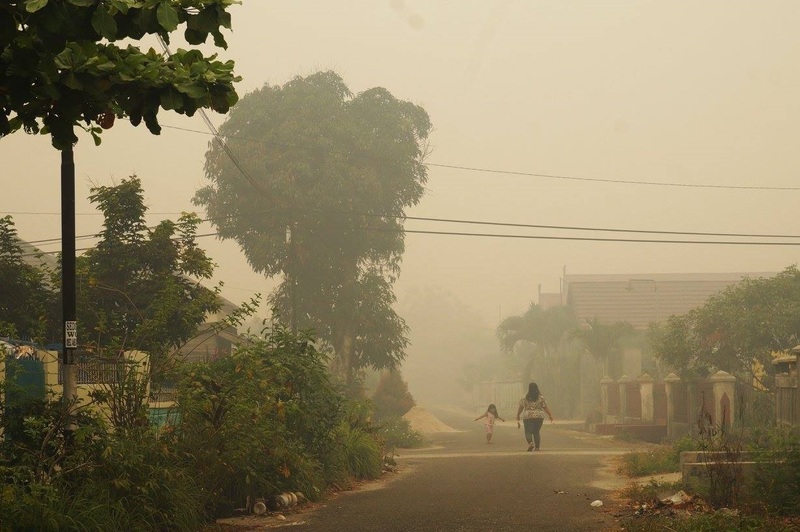 Following the 1997 fires an estimated 20 million people in Indonesia suffered from respiratory problems, with 19,800-48,100 premature mortalities (Heil, 2007) and it is likely that we see numbers like this again this year. 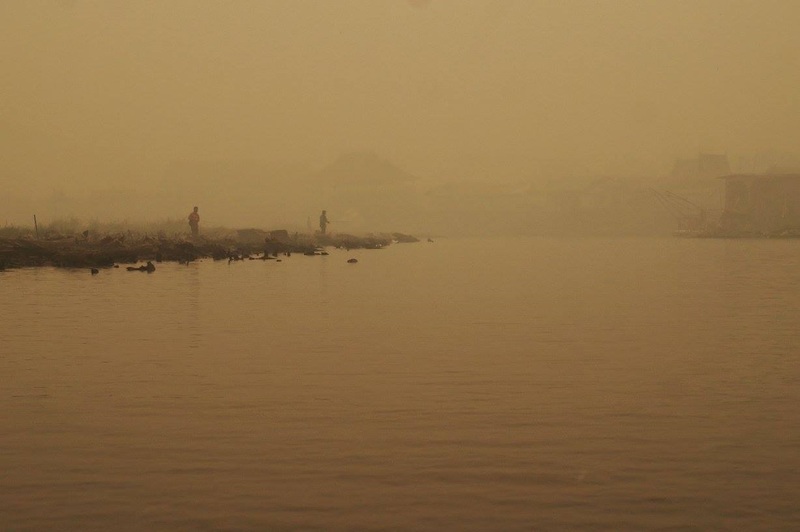 Living in the haze, you are aware that what you are breathing is harming you – you can see it and feel it. Your eyes are constantly irritated and even indoors you can see the thick smoke haze hanging in the air in an acrid cloud. I experienced breathlessness and chest pains even when I was just sitting down. But dust particles are not your only worry when living in haze: carbon monoxide levels have also been off the scale, with Jakarta Post reporting that in Palangkaraya “people were in grave danger of dying painful deaths from carbon monoxide (CO) poisoning”. The dangers are therefore invisible as well. A mother and her child go on with daily life in smoky Palangka Raya. The PSI level was 2,300 that morning. Living in the haze was what I imagine living in a post-apocalyptic world to be like; you just have to look at the photos if you think this is an exaggeration. Living in these conditions makes you inevitably suffer not only physically, but mentally as well. My colleagues and I have experienced prolonged and significant stress, fatigue, and desperation to leave, and I cannot begin to imagine the mental health impacts of people who face the haze every single year. When I finally arrived back in the UK my relief was met with a guilt that I have never experienced before. I think of Palangkaraya, my friends, my research assistants and their children, and the fresh air here is a bitter comfort with the memory of what they are experiencing back in Indonesia. For those of us with the privilege of breathing fresh, healthy air and sitting in our comfortable offices, it is our responsibility to do what we can. If you would like to make a contribution, the Orangutan Tropical Peatland Project is raising funds for local firefighting teams here.